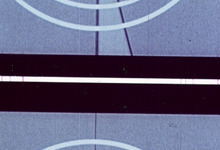 Fragments of 35mm films were cut along and reperforated into 16mm gauge. 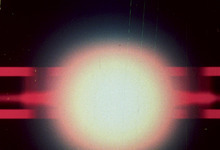 The result of this sort of amputation, of physical reduction, it is an image struggle on two levels, where the conceptual ground of found footage (stealing, recycling, subverting) meets the technical battlefield between formats (each 35mm is frame divided into two consecutive 16mm frames). What you hear is what you used to see.